This lovely soap is the perfect gift for any home. Each black, bird shaped soap contains a handmade ceramic bird at its center, which remains as a keepsake once the outer soap has washed away. Through the daily act of washing, you will eventally free the clean, white, ceramic birds inside - potent symbols of restoration and recovery. Click here to be notified by email when Bird Project Soap becomes available. While the BP Deepwater Horizon Oil Spill happened in 2010, cleanup efforts are still underway today! The BP Spill of 2010 is considered the largest marine oil spill in the history of the petroleum industry. 200 million gallons of crude were spilled into our Gulf Coast for 87 days straight, killing thousands of mammals and sea turtles, and more than 1 million birds. 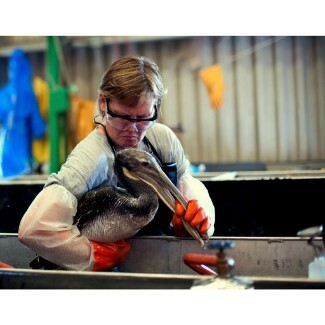 To date, Goods That Matter Bird Soaps have raised over $24,000 for Gulf Coast cleanup efforts. Your purchase today supports environmental cleanup and care for affected animals of the on-going BP Oil Spill efforts, as well as current oil spills, through Gulf Restoration Network & International Bird Rescue.